Kiev is a buzzing city of Ukraine. So it has several attractions for tourists. 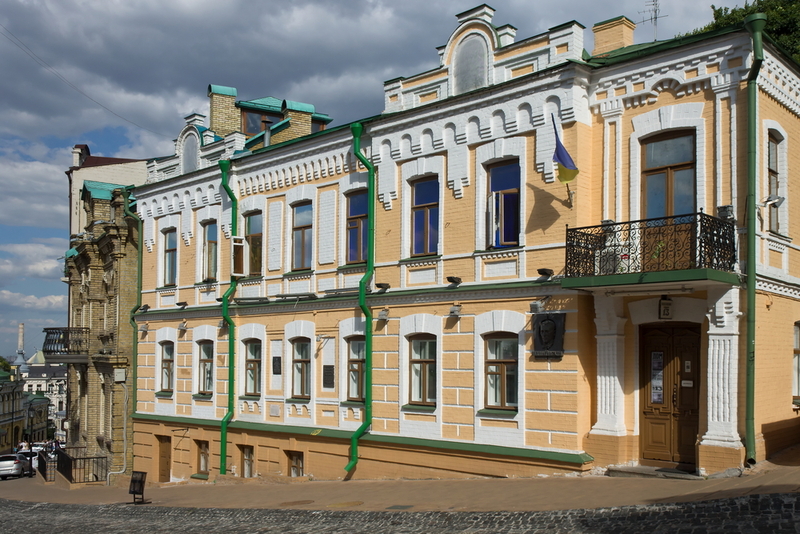 So there is a historic descent which connects Kiev’s upper town neighborhood and Podli neighborhood. This is Andriyivskyy Descent. This is one of the major tourist attractions in Kiev also advertised by travel operators as “Montmartre” of Kiev, Ukraine. 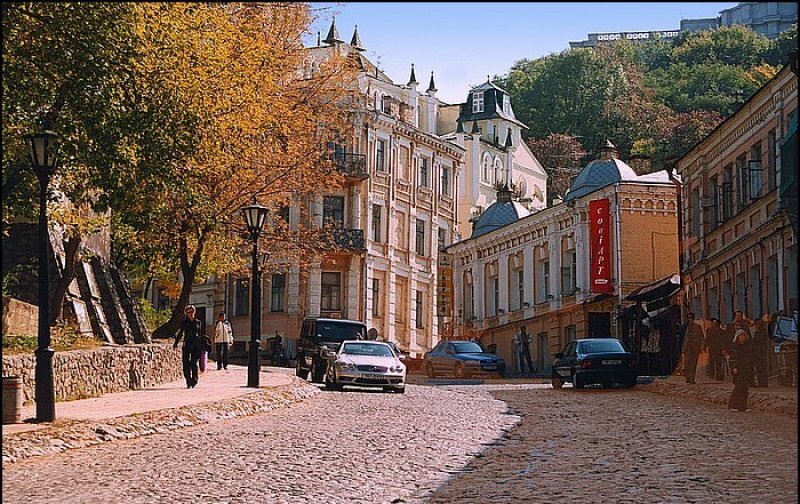 Andriyivskyy Descent is a historical and one of the best known streets in Kiev and so attracts all those who are on Ukraine trip or Kiev trip. So the Andriyivskyy Descent Street on its way is marked by some historic landmarks and monuments such as Castle of Richard Lionheart, the baroque St. Andrews Church, Mikhail Bulgakov’s (famous Kiev born Russian writer) house and several other attractive monuments. Let us Explore the Descent in next paragraphs. The descent is 720 meters in length. The descent begins on the summit of Starokyivska Hora near St. Andrews church and continues on down and goes down steeply around Zamkova Hora hill which ends near the Kontraktova Square in Podli. In early times the descent was known as Borychiv Descent and during 18-19th centuries it was inhabited mainly by merchants and crafts people. 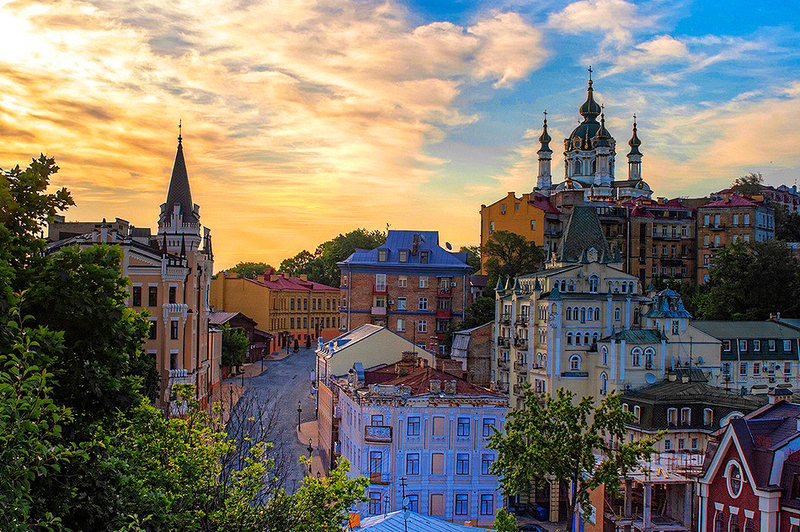 Today the descent street thrives because it has several historical monuments, buzzing gift shops, small art galleries which showcase paintings and sculptures by Ukrainian artists and so offers the travelers good time to spend here. 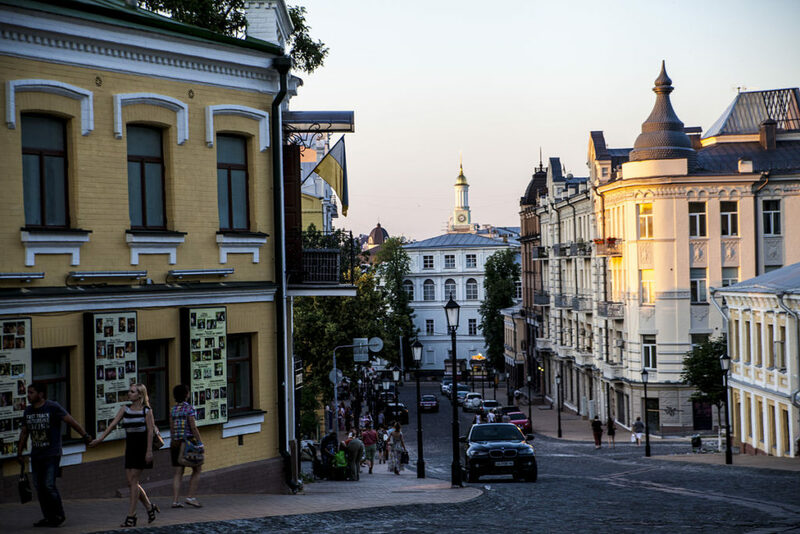 That is why the Andriyivskyy Descent is one of the favorite spots in Kiev for tourists. So as mentioned the street has several historical monuments, let us look about them a bit. 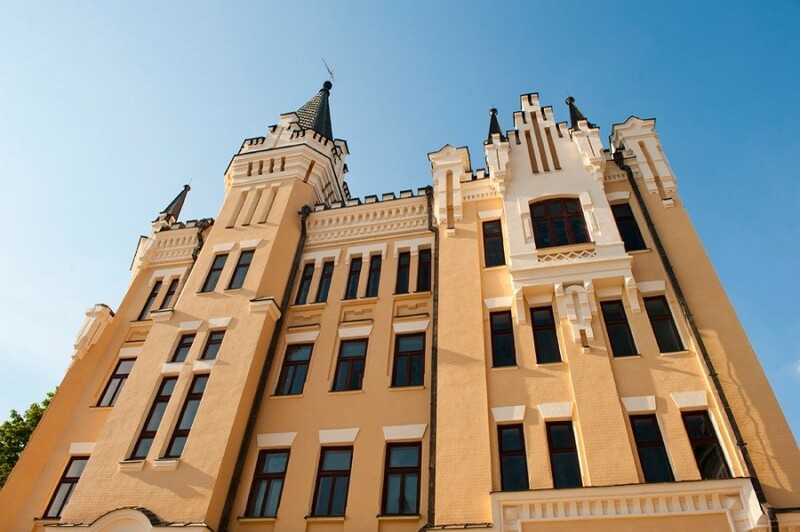 This famous house was built in 1904 and was originally supposed to be known as Orlov House. Today this historic house is being converted into hotel. This church is another attraction of the street. It is located on the top of the hill and you can see the Podli neighborhood from this point of Andriyivskyy Descent. The church was built in 1754. The church looks beautiful and you should spend some time here. This is house of famous Kiev born Russian Writer Mikhail Bulgakov. He and his family lived on the street here in 2 different houses in early 20th century. The house and street during turbulent times in 1917 Russian Revolution is well described in Bulgakov’s novel “The White Guard”. 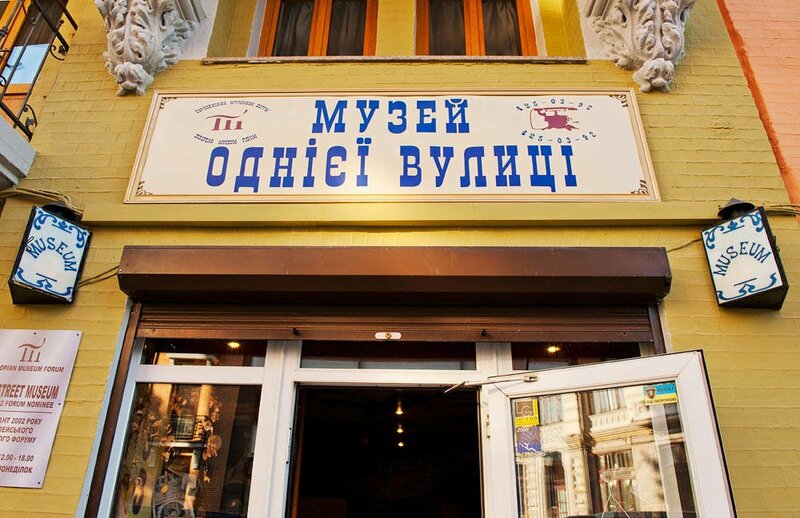 There is a museum inside the house where you can see various Bulgakov’s objects and other thematic exhibitions. Another attraction on the street is One street museum. This museum houses many historic items of the descent which goes beyond 6500 exhibits. 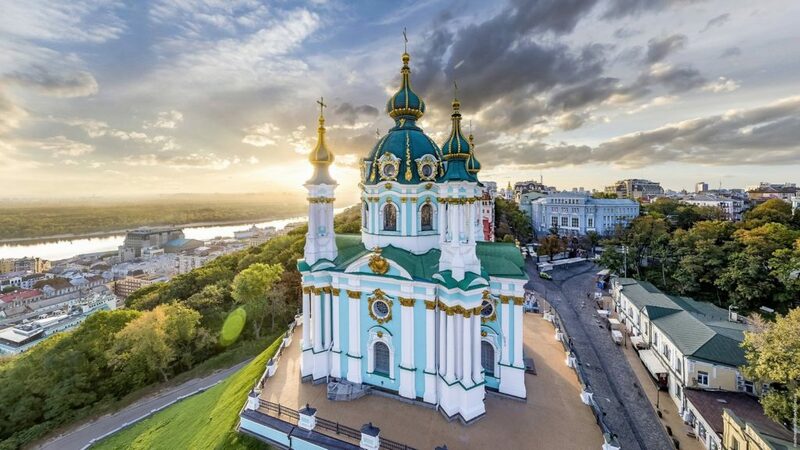 All these include information about St. Andrew’s Church, The castle of Richard Lionheart and several other buildings on the Andriyivskyy descent, Kiev. There are other monuments on the street as well. Some of them are monument to the Yaroslav the wise, the grand prince of Novgorod and Kiev, Monument to the Pronya Prokopovna and Svirid Golohvastov, monument dedicated to the famous Ukrainian poet and artist Taras Shevchenko and in recent times there opened a monument on the Andriyivskyy descent dedicated to the writer in former Soviet Union. 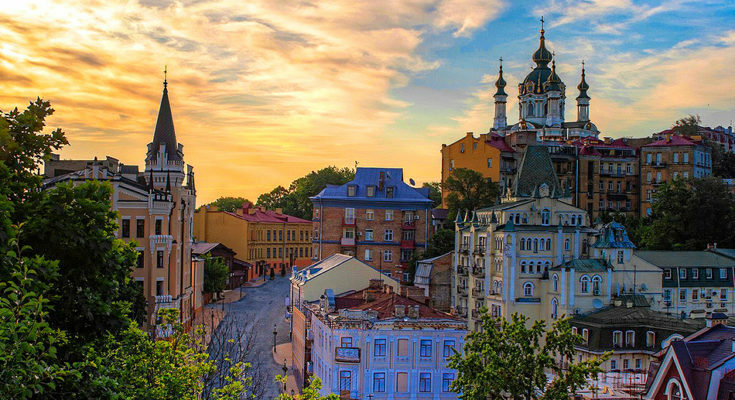 The panoramic view of the Andriyivskyy descent along with Podli neighborhood, Kiev’s upper town and the surrounding area of Zamkova Hora is beautiful and if you can capture it in your camera you must do so. So be on the street and get some good time for yourself. Visit the Andriyivskyy descent street with interest and you will find lot of details that you would be willing to tell others when you come back. So next time when you are planning for Ukraine travel package or Kiev travel package do spend some time in length at Andriyivskyy descent street.